The latest death is prompting politicians to accelerate the implementation of a construction safety law passed in 2017. 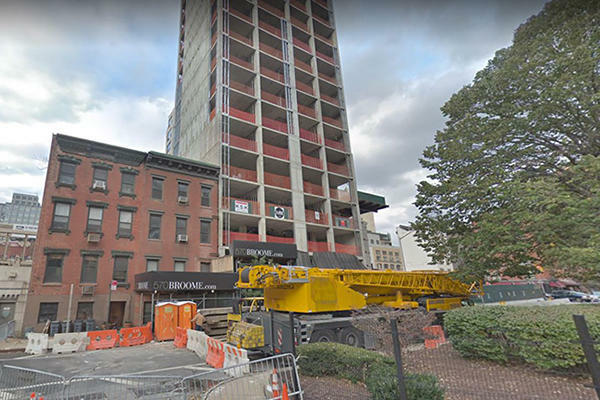 Gregory Echevarria, 34, was killed after a crane counterweight fell on him around 3:15 a.m. at the site of 570 Broome Street. At least one other worker was injured in the accident and taken to hospital, according to the city’s Department of Buildings. Records show there were at least two complaints filed with the DOB regarding safety concerns on the job site prior to Echevarria’s death. A partial stop work order was rescinded on April 8 after a DOB inspector visited the site. This is the third fatality on a construction site this week: a 23-year-old worker fell to his death while laying bricks at a co-op in Brooklyn Heights on Wednesday and a 51-year-old worker was killed by falling debris on Monday while repairing masonry at a Turtle Bay rental. “It is also a reminder of the importance of implementing the construction site safety training mandates of Local Law 196 of 2017, which will be a vitally important way to prevent future fatalities like these,” Cornegy’s statement continued. The 54-unit condo project at 570 Broome is owned by Turkish-American developer Murat Agirnasli and partners, according to the New York State Attorney General’s office records. According to the condominium’s most recent offering plan, the developers have a target sellout of about $146.6 million. Requests for comment from the building owner, engineers and contractors listed on DOB work permits were not immediately answered. Rudansky confirmed the general contractor for the project was KSK Construction Group.